This should hopefully stop your graphics card catching fire. EVGA has had a tough week amid reports of serious overheating issues in certain models of its GTX 1070 and GTX 1080 graphics cards. It has become apparent the heatsink on these cards only covers the GPU core, rather than covering the core, memory, and VRM. EVGA responded, saying in recent tests it has been applying additional thermal pads between the backplate and the PCB which had resolved the issue. However since then, even more reports have cropped up, with some users' cards actually catching fire. Operating temperatures as high as 107 degrees Celsius, well above the card's rated operating temperature have been reported, and EVGA has now issued another statement. The company has been testing its cards using Furmark, an extreme stress utility, and has come to the conclusion it needs to offer a VBIOS update. The update will "adjust the fan-speed curve to ensure sufficient cooling of all components across all operating temperatures." EVGA says the update will be released during the next few days, and all cards shipped after November 1 will have the update applied already. 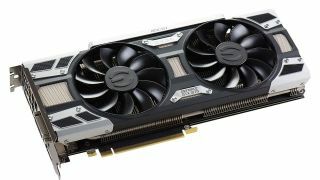 "This update resolves the potential thermal issues that have been reports, and ensures the card maintains safe operating temperatures," says EVGA. Plus, the company says your card shouldn't have been damaged by running at higher temperatures, but will honor any relevant warranty services. You can download and apply the update yourself, but if you're not comfortable doing so, you can request a warranty cross-shipment to exchange your product for an already updated one. An interesting thing to note is that the cards supported by these updates include both the 6GB and 3GB versions of EVGA's GTX 1060s, despite issues only arising on the GTX 1070 and GTX 1080 so far. So even if you thought your card was safe, check here to make sure it's unaffected. The thermal pads which were offered before this recent announcement are still available for "users who want additional cooling." However EVGA says these are optional, and not required once you have the BIOS update. They will still be free of charge if you want them, though. If you've got a card with an ACX cooler and a backplate, you can request the cooling pads at the bottom of the FAQ page. Also, if you accidentally damage your card during the optional pad installation, EVGA says it will "stand behind its customers with full warranty and cross-shipment."